It is true that marble is commonly multi-colored, but since there are two opposing teams represented by different colors, a marble chess set needs to have different colors for each side. Here we try to present different marble chess. Look at the picture above! 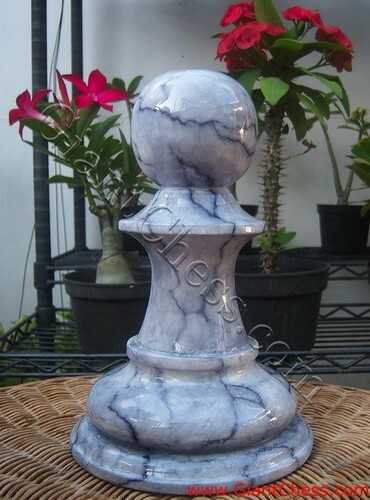 Do you think the chess piece above has made from marble material? the answer is NO. Our main material is best quality of Teak wood. The chess piece above has polished well in order to looks like a marble chess. Because of our expert cratsman, the handmade product has carved and polished well so it looks so beautiful and unique. Marble chess sets are very durable and can withstand extremes in weather and temperature. Marble sets are excellent for use outdoors and can be left in the sunshine, rain or snow without being damaged. It can actually become a permanent fixture on your porch or patio, so you don?t have to be confined to playing chess indoors.